I grew up hearing stories of my Dad’s tall ship adventures in his time as a Danish sailor. Likely exaggerated (as all good stories are), he would tell of the ship plunging into wild seas at 90° angles, dodging icebergs, and surviving against the odds through vicious North Atlantic storms. 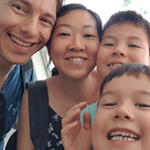 Fortunately, my family’s first experience on a cruise with kids was vastly different! 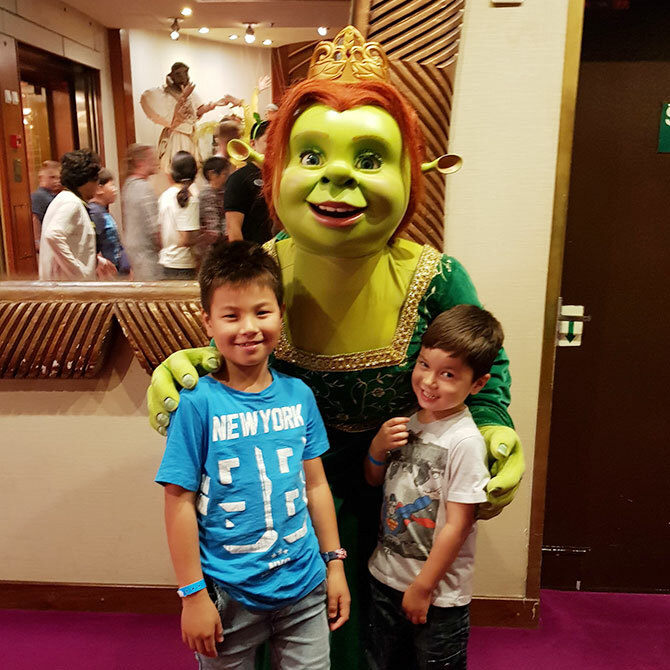 Here’s a glimpse of that experience from just the first day of our cruise with kids. 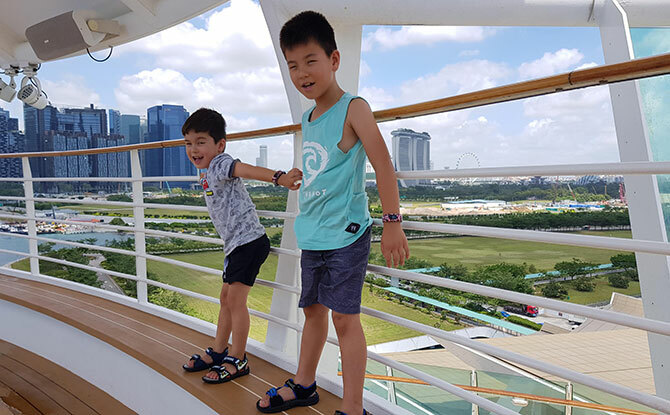 We boarded the Royal Caribbean’s Voyager of the Seas quite seamlessly at the Marina Bay Cruise Centre Singapore after being issued with our “sea pass” cards which acts as both credit card and passport for the seven-night cruise. Port Klang, Penang, Langkawi and Phuket, here we come! The moment we stepped foot on board, we were wowed by the grandeur of the vessel. After the kids reassuringly counted the lifeboats (perhaps reading about The Titanic beforehand was not such a great idea), we made our way to the Royal Promenade. This area is in many ways the heart of the ship. 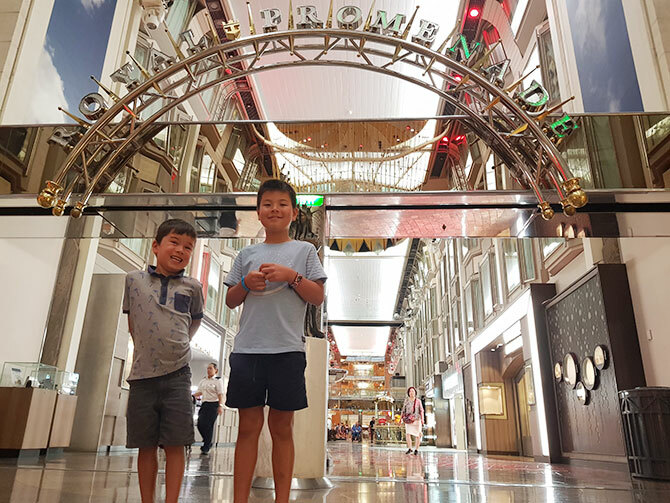 It features luxury shopping, live performances, pubs and lounges but for our little sailors, their eyes were solely on the 24 hour, unlimited pizza and cake selection at Café Promenade. 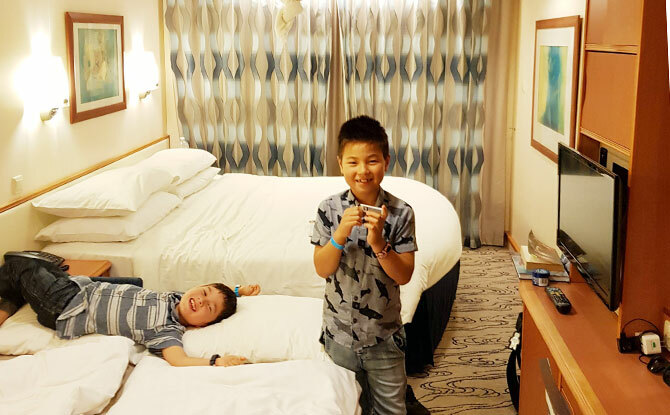 From there, we climbed to Deck 11 and went about discovering the ship’s pools and spas. We regretted not packing the kids’ swimming gear in our hand luggage as it would be another three hours until our luggage would be delivered (that equates to “forever” in kid time). After resisting their pleadings to jump into the water fully clothed, we lured them away by the offer of mini golf on Level 12. I doubt that even Tiger Woods has played in such a magnificent setting with the Singapore skyline framing our backdrop. Based on our dismal collective performance on the greens, it was a good thing when the announcement came that our rooms were ready and cut short our play. There would be plenty more time for rock climbing, the flowrider, ice skating, the arcade and other attractions over the coming days. As we opened our room door, two very excited kids pushed their way through to test the bed springs by jumping on it (its ok, they were our kids… and the mattress passed its test). The room was great. It was surprisingly roomy, had clever storage solutions, a decent sofa (and sofa bed at night) and, most of all, a stunning view from the balcony. Being a former accountant, I usually relish the opportunity to save a dollar but I can’t recommend enough spending the extra to get a room with a balcony if you can. 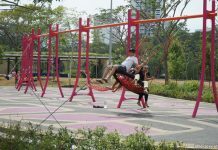 It creates a sanctuary for parents when the kids go to bed, provides a beautiful view to experience the wonders of sunrises and sunsets, and is the perfect place to hang washing if you’ve keen to do your own. 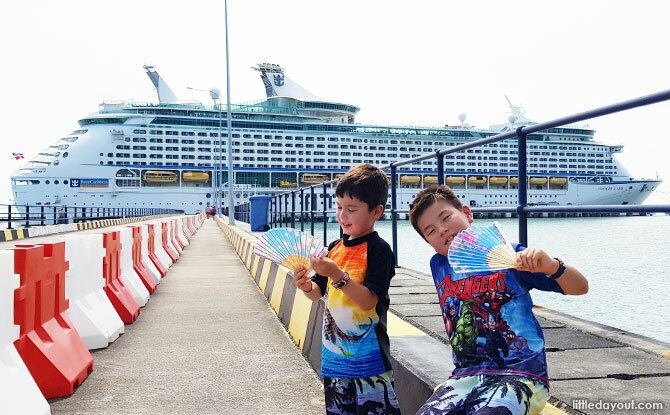 Ok… parents let’s be honest, the Adventure Ocean Kids Club is the part of the cruise we all look forward to the most. Three sessions each day, amazing entertainment by brilliant staff for our little ones, and for us “FREEDOM” (picture that Braveheart scene here). 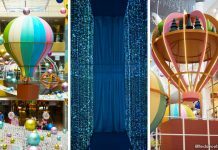 Programmes at the cruise ship’s Kids Club included Aquanauts for ages 3 to 5, Explorers for ages 6 to 8, and Voyagers for ages 9 to 11. As excited as we were to drop our kids off, it was important to be patient. 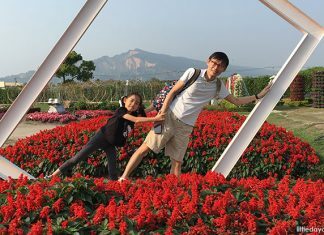 As adults it can be intimidating to go somewhere new where you don’t know anyone so you can imagine how it would be for the kids. We found that setting a time with them that we would pick them up (and keeping to it) as well as outright bribery worked. We bought a pack of hot wheels cars pre-cruise that we gave out as rewards. In the end, the boys loved Kids Club and my 6-year-old made a new best friend, even though he can’t remember his friend’s name. Overtired Kids + Sugar Overload = Kids Club! (Just kidding… = Disaster!). So, we were pretty strict with the night entertainment but the kids still got to experience the ice skating show, juggling show and singers & dancers as the cruise continued. On the first night, there was a special Dreamworks parade with Poh and the Penguins of Madagascar, which our kids especially loved. Getting high fives was a magical experience for them (and me)! 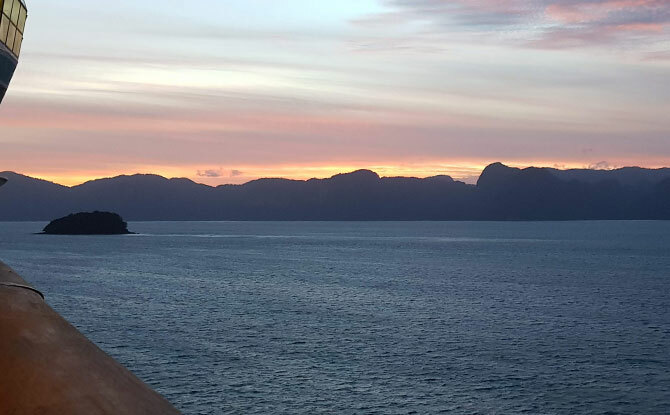 There are two main dinner options – casual buffet dining at the Windjammer (there’s a gym onboard if that makes you feel better) or the fine dining option at the three-level Sapphire Dining Room. Normally, I’d balk at the idea of taking my little connoisseurs somewhere like this but we thought we should try the fancy route. 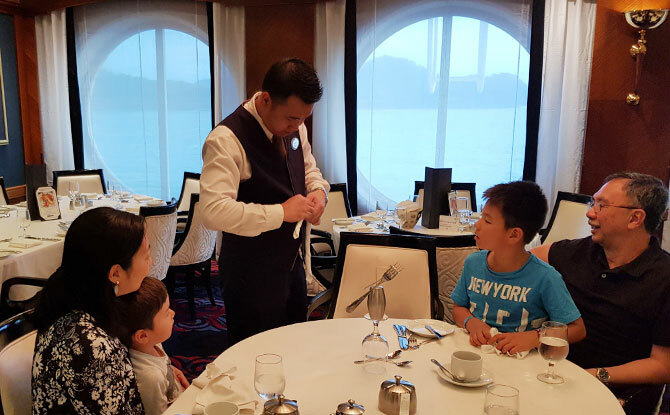 Having preselected the 5.30 pm timeslot, we were ushered to our ocean view table that would remain ours for the cruise duration. For the most part, the food was great as we were treated to three courses in a beautiful atmosphere but what made the experience exceptional was the service by our wait staff. The Crew Were the Best! I could write a novel on the experiences both on board and at our destinations. From motorcycling in Phuket with my seven-year-old (don’t tell my wife!) to teaching my 6-year-old to ice skate for the first time. Herry, our room attendant, was the nicest guy you could ever meet. 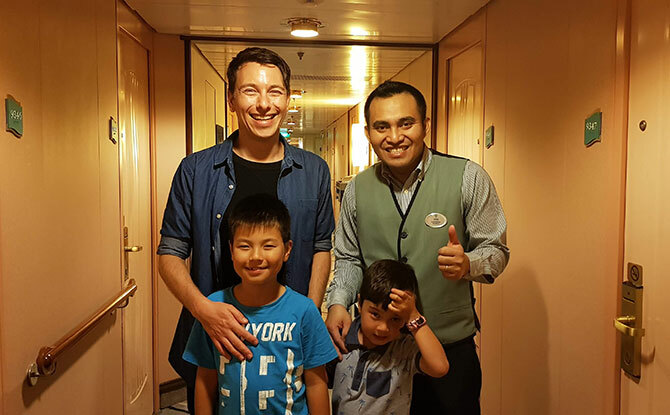 But, when I asked my boys what they were most thankful for at our last meal at sea, they mentioned Herry (our room attendant), Michael and Liqin (our assigned waiters for every dinner). Herry would make a different towel animal every night surprising them and then high fiving them as they came to thank him. Michael served up dinner and post-meal magic tricks building such rapport with them. 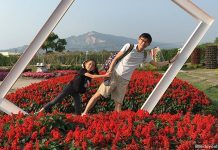 And Liqin with her friendliness and hey who’s not going to fall in love with the one who brings dessert each night? 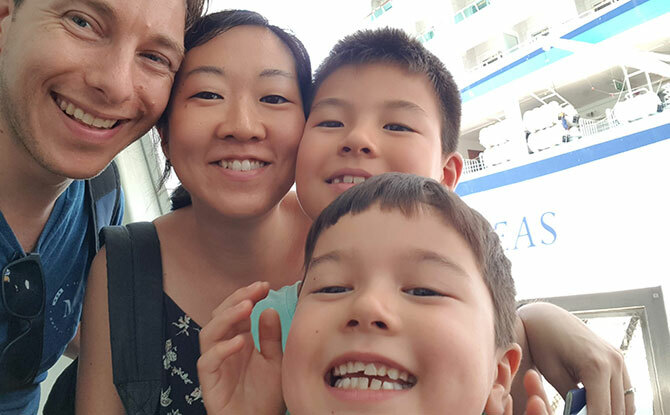 If you’re looking for a break where you can switch off from social media, have real quality time with those you love most and make memories that will last a lifetime then you can’t get much better than a holiday at sea – escape away on a cruise with kids! 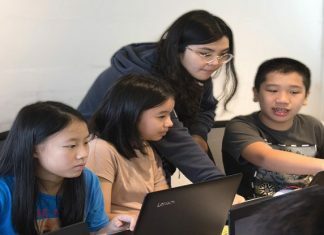 Next articleRestaurants in Singapore Where Kids Eat Free 2019: Family-Friendly & Wallet-Friendly Too!